Nearly 50 years of conservation efforts have been unable to prevent orangutan numbers on Borneo from plummeting. 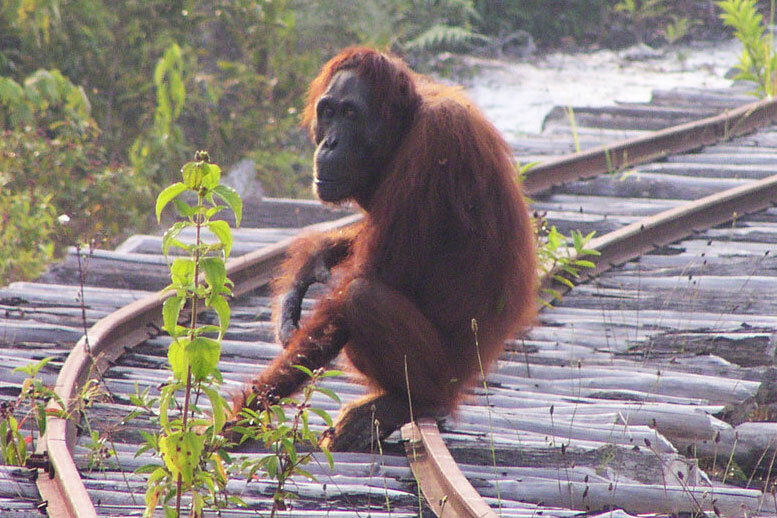 The latest data published by a team from 38 international institutions, led by researchers of the Max Planck Institute for Evolutionary Anthropology in Leipzig, Germany, the German Centre for Integrative Biodiversity Research (iDiv) and Liverpool John Moores University in Great Britain, suggest that between 1999 and 2015 the total number of Bornean orangutans was reduced by more than 100,000 animals. This result means two things. First, there were more orangutans on Borneo than previously estimated. Second, they are disappearing even faster than researchers had envisaged. The most dramatic rates of decline in orangutan populations were found in deforested areas and in areas converted into agricultural land. Surprisingly however, the absolute number of orangutans that were lost was greatest in selectively logged and primary forests, where most orangutans occur. In these forest areas human pressures, such as conflict killing, poaching, and the collection of baby orangutans for the pet trade have probably been the major drivers of decline. The new study, which represents the most comprehensive data coverage to date, is in line with another recently published analysis of orangutan population trends, and reinforces the recent uplisting of the Bornean orangutan to Critically Endangered on the IUCN Red List. Lead author Maria Voigt of the Research Center iDiv and the Max Planck Institute for Evolutionary Anthropology explains why the current rates of decline are so much higher than previously thought: “As we collected more data on orangutan density and presence our ability to model their distribution and population trends improves.” Voigt adds: “This is how we learned that orangutans are distributed much more widely and also occur in more degraded forest areas and even some plantations”. Orangutans have often been described as a highly sensitive species that can survive only in the most pristine ecological conditions. The more researchers learn about orangutans though, the more they find that they are resilient and can adapt to new challenges. For example, orangutans walk on the ground more often than previously thought, and they can feed on plants that have not been part of their natural diet, such as acacia or oil palm. These behaviours may allow them to survive in fragmented landscapes and much smaller forest patches than previously thought possible. “The one thing they cannot cope with, however, is the high killing rates seen currently”, explains co-author Serge Wich of Liverpool John Moores University. “Orangutans are a very slow breeding species, and models used in previous studies indicate that if only one in 100 adult orangutans is removed from a population per year, this population has a high likeliness to go extinct”. Another study on killing rates indicated that as many as three to four per 100 adult orangutans are removed per year from populations on Borneo. These results would explain the high population declines in Borneo’s forest areas. There is a positive twist to the story says Hjalmar Kühl of the Max Planck Institute for Evolutionary Anthropology and the Research Center iDiv, who led the study and has conducted similar studies for Sumatran orangutans and African gorillas and chimpanzees. “There are actually more orangutans than we had previously thought, and some populations appear to be relatively stable.” This was also shown in a recently conducted, but as yet unpublished, population and habitat viability analysis coordinated by the Indonesian conservation authorities in collaboration with international experts. These safer populations in parts of Malaysian Borneo and larger national parks in Indonesian Borneo, make it seem unlikely that the Bornean orangutan is going to become extinct anytime soon. Still, there is an urgent need to prevent deaths. Another 45,000 orangutans could disappear in the next 35 years to habitat loss alone. Today, some 10,000 orangutans occur in areas allocated to oil palm development but still forested. If these areas are converted, most of them will die. Hunting for meat, killing in conflict situations, and the collection of individuals as pets need to be addressed through public outreach, facilitating conflict resolution in communities, and law enforcement. In addition, further research needs to be done as to why people kill orangutans in the first place. Be the first to comment on "Global Demand for Natural Resources Causes Dramatic Decline of Bornean Orangutans"